Detroit’s only campground, Scout Hollow in Rouge Park, will reopen this spring to create overnight group-camping opportunities for city youth. It has been closed for more than a decade. The reopening is supported by The Kresge Foundation. Camping will be coordinated by Detroit Outdoors, a collaboration between the city of Detroit’s Parks and Recreation Department, Sierra Club and YMCA of Metropolitan Detroit. 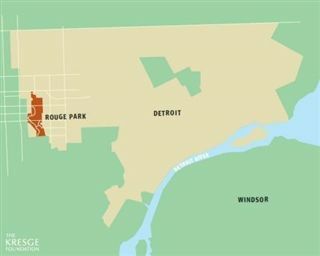 The 17.4-acre site is on a secluded bend of the Rouge River in the park of the same name. Since its closing, Scout Hollow has been reclaimed by tall grass, deer and wild turkeys. Kresge’s $200,000 grant will allow Detroit Outdoors to renovate the area with designated campsites to accommodate large groups. The grant will also stock a “library” of camping gear – from sleeping bags to tents – that groups can borrow from for their camping adventures. Detroit Outdoors will conduct camping leadership training for educators and youth development professionals as a requirement for use of the facility. “This reopens a long unavailable asset to connect city youth with nature. To really learn about nature, you must immerse yourself in it. There is simply no substitute,” says Interim Detroit Parks and Recreation Director Keith Flournoy. At roughly 1,200 acres, Rouge Park is the city’s largest. It is larger than Belle Isle (982 acres), the island park in the Detroit River, and New York’s Central Park (843 acres). Scout Hollow covers more than 17.4 acres of mostly forest with a five-acre meadow at its heart; three camping sites at Scout Hollow will accommodate up to 30 campers each. Organizers expect to see 250 campers in the first year. They expect to serve 1,000 campers annually within three years. Sierra Club, a national environmental organization based in Oakland, California, is supporting Detroit Outdoors with a $20,000 grant. For the Sierra Club, which has been working with Friends of Rouge Park for several years, Scout Hollow is a way for communities to connect with nature in an urban environment. The YMCA of Metropolitan Detroit, which has operated overnight camps in Holly and Oscoda for decades, will lead a series of camping leadership trainings at Scout Hollow this spring and summer. Organizations that send a leader through the YMCA training will be able to reserve campsites and use the gear library. “The only things boys and girls will need to bring will be their personal clothes and a curiosity for the great outdoors,” says Landry. Longtime Sierra Club volunteer and Detroit Outdoors Program Manager Garrett Dempsey* has witnessed the power of connecting Detroit youth with awe-inspiring nature. * Disclosure: Garrett Dempsey’s spouse works for Kresge in the Social Investment Practice. The Social Investment Practice was not involved in the Detroit Outdoors grant, which was made by the foundation’s Detroit Program.